AXIS A9161 Network I/O Relay Module has 6 configurable I/Os with supervised inputs and a relay. The module reacts on inputs, such as signals from PIR motion detectors or switches, to trigger actions. 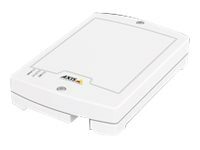 Its open platform enables a high level of integration with AXIS A1001 Network Door Controller, network cameras, and other facility systems. AXIS A9161 also works standalone. Supplying power to I/O devices, it can extend the functionality of Axis products where additional I/Os or relays are needed. Its convenient size and enclosure makes installation easy and flexible. Power out: 12 V DC and 24 V DC.